Urbana first baseman Gabe Spiers (right) helps hold the London runner close to the bag early in Friday’s contest against the Red Raiders. Urbana defeated visiting London, 5-4, in CBC softball on Friday, snapping a 31-game league losing streak. Emily Skelley got the win, going all seven innings. Skelley was also 1 for 4 with a run scored. Marah Donohoe was 2 for 4 with a double and an RBI and 2 runs scored, Gracie Hower 2 for 4 with a double and 2 RBI and Sarrah Baldwin 1 for 2 with a double. Makenna Radford was 1 for 2 with 2 runs scored. “This is the first time our defense only made one error. Overall, it was a very good team effort. It is nice to have that gorilla off your back,” UHS Coach Aaron Pittsenbarger said. Urbana (1-6) travels to Graham on Monday. Urbana defeated visiting London, 6-5, in CBC baseball on Friday. UHS’s Gabe Spiers had the game-tying single in the seventh inning and Austin Rooney walked it off with a single. Nick Weyrich earned the win and had 8 strikeouts. Urbana (1-4) travels to Graham on Monday. NORTH LEWISBURG – Triad defeated Northeastern, 10-5, in OHC softball on Friday. For the Cardinals, Kristin Bailey was 3 for 4 with a double. Shelby Sheets was 3 for 3, Kendell Hughes was was 2 for 4 with a double and Joni Russell doubled. Triad (4-1, 3-1) travels to West Liberty-Salem on Monday. NORTH LEWISBURG — Triad defeated Northeastern, 3-2, in OHC baseball on Friday. The Cardinals scored in the bottom of the sixth and again in the seventh to walk off with the win. Logan McCoy was 2 for 3 and Dylan Warner was 2 for 3. Isaiah Bruce was 1 for 3 with a triple. Ayden Spriggs got the win, allowing five hits and walking two batters. Triad hosts Urbana in a double header today, weather permitting. MILFORD CENTER – Kayle Henderson had a grand slam home run as West Liberty-Salem defeated Fairbanks, 9-2, on Friday in OHC softball. For the Tigers (5-3, 2-2), Kelsey Day was the winning pitcher and went 3 for 4 with a double and an RBI. Hannah Riblet was 2 for 3 with an RBI. The WL-S jayvees beat Fairbanks, 14-4. Maycee Miller was the winning pitcher and Alexa Stoll and Braxton Givens each had a home run. MILFORD CENTER – Fairbanks nipped West Liberty-Salem, 1-0, in OHC baseball on Friday. Tiger starter Nick Burden suffered the loss after tossing 6 complete innings of 2-hit baseball. Burden got into trouble in the bottom of the 7th inning, surrendering 3 hits which allowed the Panthers to win. Ethan Larson lined a single in the top of the fourth to prevent the Tigers (1-3, 1-3) from being no-hit. MECHANICSBURG – Mechanicsburg defeated West Jefferson, 8-5, in OHC softball on Friday. For the Indians, Audrey Ayars was 4 for 4 with a double, a triple and 2 RBI and Elyse Wilson was 2 for 3 with 3 RBI to do most of the damage. Hanna DeLong was 2 for 4 with an RBI, Macy Reed was 2 for 4 with an RBI and Morgan Heizer was 1 for 2 with an RBI. Mechanicsburg (4-1, 4-0 OHC) travels to Fairbanks on Monday. ST. PARIS – Graham defeated Kenton Ridge, 4-0, in CBC baseball on Friday. The Falcons put four runs on the board in the first inning and held on to win. Chase Adams went 2 for 4 with a double to lead the Falcons, with Brady Anderson knocking in a pair of runs. Logan Thompson was 1 for 1 with an RBI, Logan Anthony was 1 for 1 with a double and Lane Smith was 1 for 4 with an RBI. Graham (4-2-1) visits Piqua today. ST. PARIS – Graham lost to Kenton Ridge, 14-8, in CBC softball on Friday. Lexi King took the loss, giving up 12 hits. For Graham, Alyssa Theodor was 3 for 4 with 2 home runs and 4 RBI, Lexi Mullen was 2 for 4 with a pair of doubles, Morgan Pine was 2 for 4 with a home run and 3 RBI and Olivia Bryant was 2 for 3 with an RBI. The Cougars scored a pair of runs in the sixth and five runs in the seventh inning to take the lead and break the game open. Graham scratched across two runs in the seventh, but couldn’t mount enough of a charge. “The game really came down to the last inning,” GHS Coach Ralph Foster said. Graham (4-3, 1-2 CBC/MRD) hosts Urbana on Monday. PIQUA – Urbana defeated Piqua, 3-1, in non-league boys tennis on Friday. At 1st singles, Ethan Burnside won, 6-0, 6-0. At 2nd singles, Ethan Headlee won, 6-0, 6-2. At 3rd singles, Jacob Coffey won, 6-0, 6-3. At 1st doubles, Michael Trudo and Riley Johnson lost, 6-0, 6-0. There was no 2nd doubles match. Urbana is now 5-3 on the season. 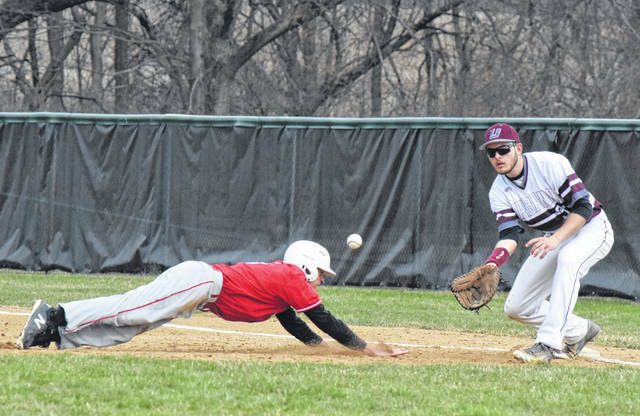 https://www.urbanacitizen.com/wp-content/uploads/sites/36/2019/04/web1_GabeSpiers040519_ne201945191036874.jpgUrbana first baseman Gabe Spiers (right) helps hold the London runner close to the bag early in Friday’s contest against the Red Raiders.